Joe Mazzone joins the 300+ Mile Club! 2018 Ultraskate World Rankings Update Coming! A dynamic database version of World Rankings is in the works. In the meantime, here are the final results for the three major Ultraskates of 2018. Rubbing my eyes, wondering if this is correct. INCREDIBLE!! Congrats to Kyle Yan and Jonathan Koning join the 300-mile club! Congrats Rosanne de Lange for cracking the 250-mile barrier! Check the 2017 Summer LDP Events! Jake attempted to break Rob Thomson’s World Record (7,555 miles) skating the most continuous miles on a skateboard. When Rob calculated his mileage this was over China, Europe and the US. Rob’s cross-US portion was 3436 miles, so Jake planned to double-back (and maybe do some extracurricular miles) to surpass the record. Update 7.2.17: From some accidents and chiropractic advice on the road, Jake’s following docs orders and packing it up early. A solid attempt, rest and recover Jake! Miami Ultraskate 2017 was off the hook! Don’t-Trip Dan’s Bennett-like”Bhangra” LDP truck is under test! Several skaters are hitting the roads and pumping some serious distances on these, to help in vetting final design tweaks. Butter-smooth feel and a refined “dive”, put a precision twist on the 1975 truck! Rick Pronk joins the 300+ milers, and New Women’s World Records set! 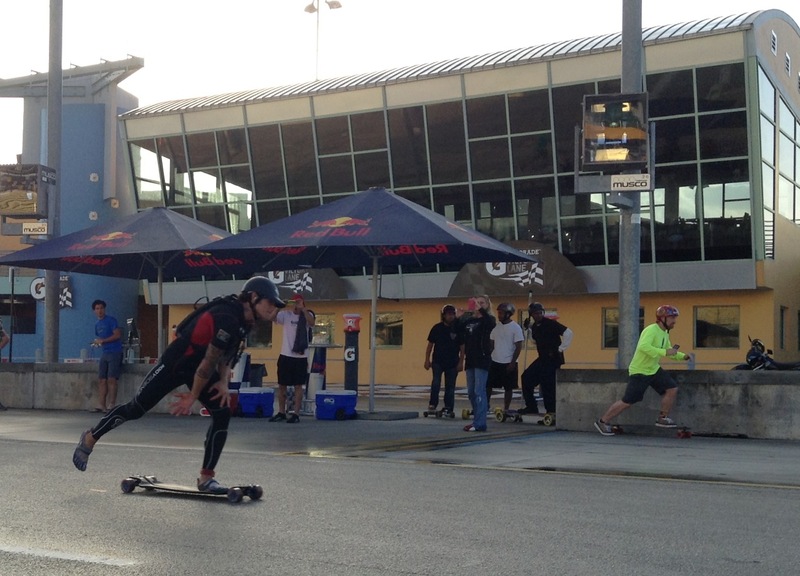 The 24-hour Ultraskate World Rankings are now updated with results from June’s Dutch Ultra!! – Friendships and Ultraskate family grows! Rick Pronk nearly ties Andy’s 309.5-mile record! Technically it was the length of the laps of the track that kept him from “officially” being tied, as there were several minutes left on the clock, just not enough time for that critical last lap! 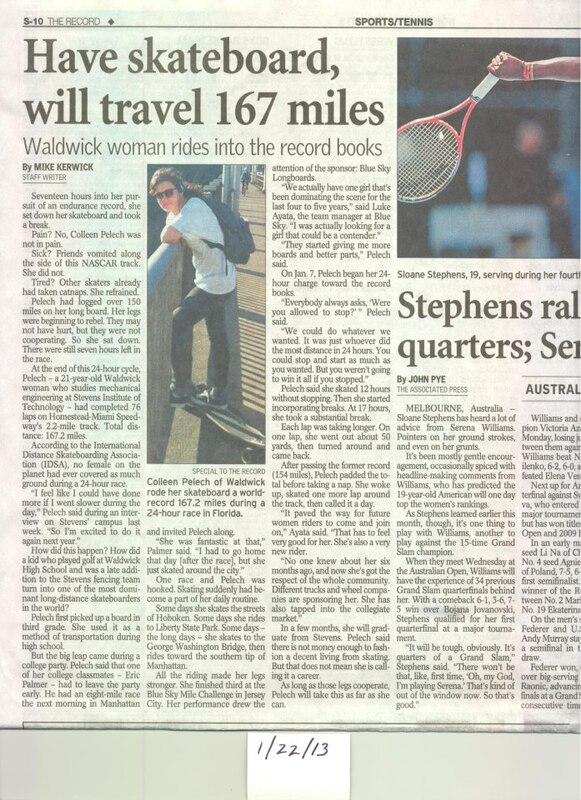 Rosanna de Lange, new Women’s World Record Ultraskater – 221 miles!! New 4-man Team World Record from the Vandra boys. 318.7 miles!! 300-mile barrier smashed at Miami Ultraskate 2016!! THANKS to the Dutch crew especially for being so patient. I’ve finally updated the Worldwide Rankings for Ultraskate on the RECORDS page. Thank you again Lennart for the diligence on the data! With Rick Pronk’s amazing close 2nd to Andy, 30 skaters now make up the 200-mile club, and with this update of so many Dutch Ultraskaters, another 20 added, bringing the full list to over 150 ultraskaters past the 100-mile mark!! And almost 30 distance skaters have joined the 200-Mile Club! 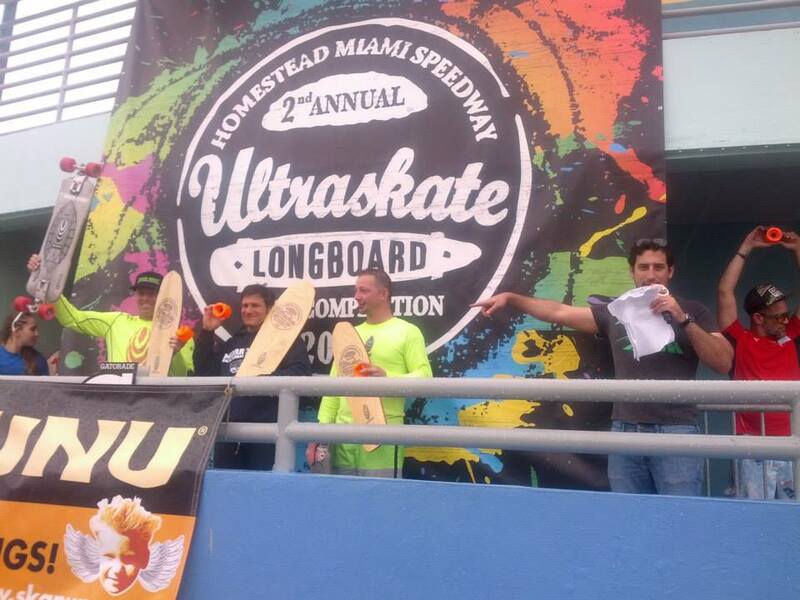 MIAMI 24-hour Ultraskate 2014 ROCKED — CONGRATS ALL! Thank you Joner Strauss for another awesome event raising the bar and blowing up distance skateboarding to new levels. 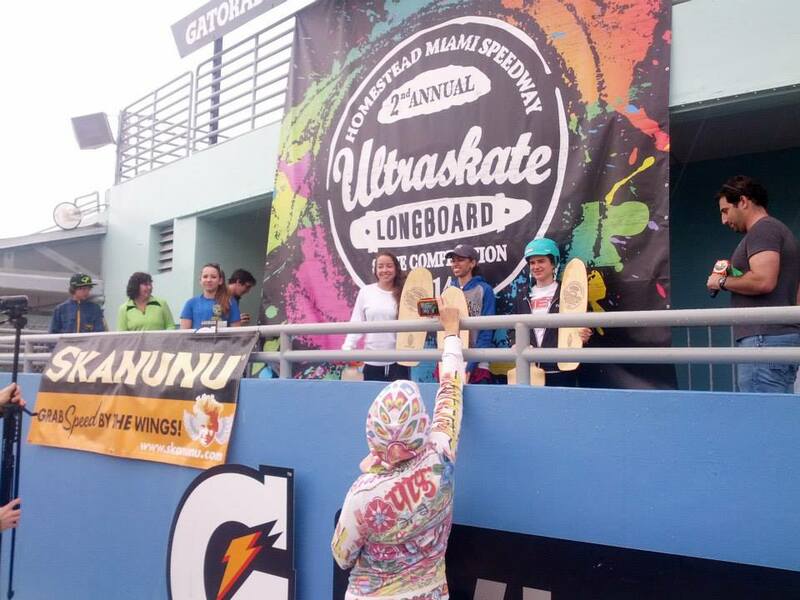 Congrats Lonneke Pollepel – new Women’s Ultraskate Champion! 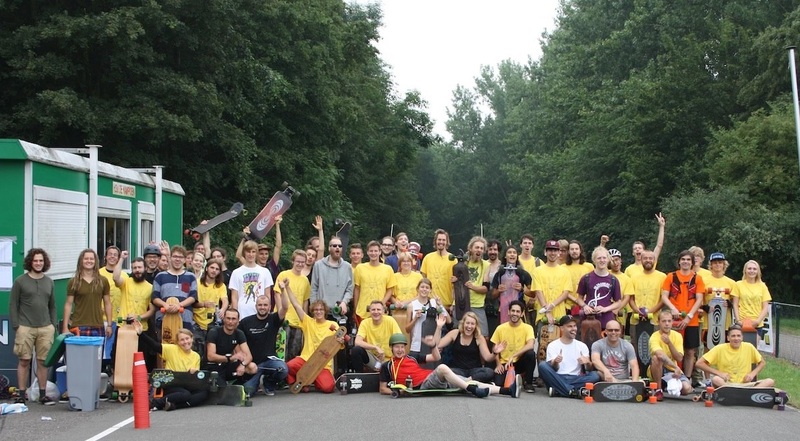 Congrats Iemke Postma – 1st in Europe, and 2nd in World Ultraskate overall! LADIGA 3rd Year – Madness!! This is a shot of the racers leaving the trailhead on the final Day 3, at 7:40 a.m. They knew it was going to be another day of rain. What they didn’t know is it was to be constant torrential thunderstorms, winds blowing debris all over the trail, and lightning splitting trees and knocking them over the trail! Everyone has made it back and they held the final Awards Ceremony, once again Paul Kent takes 1st for men and Colleen Pelech for the ladies. Congrats to everyone who made it through to the other side!! New 24-hour World Records SET at Miami Speedway!! This event is Friday Oct. 19th – The day before the Broadway Bomb in NYC — Registration closes at midnight Oct. 18th. The current 1 mile record was set by Marc Juvinall at 3:46 during the Morrow Bay Mile last summer in California. This time has already been beat by multiple NYC skaters in practice, and is guaranteed to be blown away the day of the event. So even if you don’t make it into the race bracket it’s ok – you’ll know where you stand among the fastest push racers in the world! 188miles is not an easy distance to wrap your mind around, nor is it an easy distance to cover, BUT if you think you can, you are probably right. So how? Be Prepared! Last year I was not prepared. I began day 1 (37mi), in 90 degree heat, with nothing but a gel pack, while everyone else had camelbaks. You need a camelbak. Preferrably one with a 2Litre bladder. I had a 1 litre last year and had to end up bumming fluids off Andras on day 2, and using Marions pack on day three after he was injured on day 2. Also, get a camelbak that has enough room for you to carry some food. Drink before you are thirsty. Drink Before you are thirsty, Drink before you are thirsty. What helped me get through the race last year when I was alone and times were tough was not to think about the distance at all. Just being there, present, focusing on all my senses and the environment around me helped the miles just tick on by. This becomes important on day 3 on the way back, knowing you have to retrace your steps from the previous two days. So, break everything down into baby steps. Landmark goals, food rewards, make it a fun game basically. My goal this year is to be prepared, race smart, and enjoy the experience of being with 50 people doing the same challenge over three days. The experience will be what you make it. Be prepared so you can enjoy the ride. The rest is just you vs. you. vs. your board vs. your environment.. In the end – this event is absolutely cleansing. After all that pain – life is good. Portland OR P-Town Throwdown to Benefit FOOD BANK! Will ROBSKEY take it again? The Adrenalina splash of 2011 was brilliant strategy, making skateboarding industry waves and grabbing attention. In 2012 if they lower the overall payout, reduce the entry fee a little, and choose just a few longboard-centric locations, I believe they would draw much bigger crowds of racers this year, and make their organizational part more affordable and sustainable. Most of our distance skateboarding community’s into the event and energy of racing more than huge payoffs — I’m eternally grateful how they brought so many friends and fellow skaters together last year! In 2012 I think they can afford to lower the cash and be even bigger. Major props again to Jonathan “Joner” Strauss, the visionary that brought skateboard marathoning to the mainstage, and to Zalman Lekach and others who ran with the baton. Great thing is we have a lot more grassroots races popping up all over– but with last year’s momentum I really HOPE Adrenalina can pull off another year! Been seeing a lot more Subsonics on my morning Seattle commutes, and I know a lot of skaters World-wide who love his work as well. Much deserved praise to the man, Scott Moore! Subsonic Skateboards from Adam Stolte on Vimeo. CodePink How To Pump – now on the Pavedwave Channel – thanks Vlad! Follow our progress as we cover the 27-mile Burke-Gilman trail from Redmond to Seattle Washington — without touching foot to ground. 2005 World Record – 25 miles pumping without a foot down! Derek Munson rides the MS Skate almost-marathon with two bicycle escorts stopping traffic and thwarting other impediments. Cyber Mile – log your current pump mile, and track your improvements over the year! This entry was posted in pavedwave.org by pavedwave. Bookmark the permalink. Thanks for putting it into context for us James. It does belong in the history books!